CASTELBUONO, Sicily (CN) — Italy’s new right-wing interior minister Matteo Salvini is keeping to his hard-line campaign promises and has begun to close his country’s borders to refugees and immigrants from war-torn and impoverished African and Middle Eastern nations. Italian leaders have long complained that the rest of Europe has done little to help Italy cope with the tens of thousands of people crossing the Mediterranean Sea in search of refuge and work in Europe. Salvini is ratcheting up that rhetoric and pushing an agenda not only to close Italy’s borders to migrants and refugees, but to deport a half million people whom he says are living illegally in Italy. On Sunday, Italian leaders told Malta, a small island nation and European Union member, to open its port to the Aquarius. The Aquarius, is run by SOS Mediterranee, a humanitarian organization that picks up people crossing the Mediterranean in flimsy, often deadly, vessels, such as skiffs, rubber boats and inflatable rafts. Legally, who is responsible for these immigrants is a gray area. 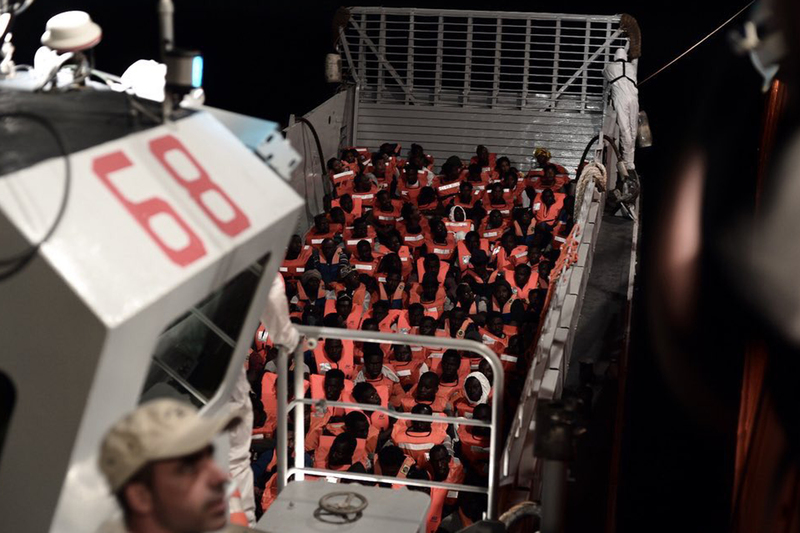 They were rescued in Libyan waters in an operation coordinated by Italian authorities, yet the closest European port is in Malta, said Roberto Carmina, an attorney and monitoring officer for UNICEF in Sicily. He works on behalf of refugees and migrants. “Now they must find a solution because this ship will eventually have to dock somewhere,” he said. Carmina said Salvini appears to be “playing in an arm-wrestling match” with other European nations to change the treatment of the waves of migrants from Africa and the Middle East. Carmina said it would be momentous if the Aquarius ended up docking in a European nation other than Italy and unloading its hundreds of tired and tormented passengers. SOS Mediterranee did not immediately respond to emails seeking comment Monday. Sea-Watch responded to an email query and cited its public statements. The Dublin III refers to an agreement among European states on how to deal with asylum seekers in the European Union. On Monday, the Interior Ministry was not able to respond immediately to a request for information on the unfolding drama in the Mediterranean. The new interior minister, the 45-year-old Salvini, is the head of an anti-immigrant and secessionist northern Italian party, whose name he recently shortened to the League in a bid to appeal to more Italians. The party previously was known as the Northern League, recalling its origins as a fiery regionalist party born out of the Pianura Padana plains of Veneto and Lombardy. Until recently, the party’s objective was to make northern regions autonomous from the central government in Rome. The party, once ridiculed as extremist and unreasonable, has grown since the 1990s and is now Italy’s second-largest party, having swept up parliamentary seats across northern Italy in general elections on March 4. The League this month joined forces with a left-leaning populist party called the 5-Star Movement, which took seats across southern and central Italy. Together they have formed one of the strangest governments that Italy has ever seen. The victory of these two seemingly opposed populist parties — the 5-Star Movement’s leaders and supporters are often flamboyant, anti-establishment and dedicated to welfare and environmental issues — was sealed in large part by their points in common: A hard-line on immigrants, a cold shoulder to the European Union and major changes to the nation’s economy and tax system. On Sunday, Italy held municipal elections and the nation’s newspapers reported that the League had done well, while the 5-Star Movement did not fare so well. Italy is undergoing a period of turmoil as the establishment center-left Democratic Party seeks to regain its footing since its devastating loss in the March 4 general elections. Italy’s center-right party led by Silvio Berlusconi, known as Forza Italia, also fared poorly in the general elections. Salvini, then, appears to be the Italian politician with the wind at his back and he has made stopping immigration to Italy his top priority. “Public opinion is in favor” of what Salvini is doing, Carmina, the UNICEF lawyer, said. He said Italians in both the north and south want the wave of migration to stop. In the wealthy north, Carmina said people see newcomers from Africa as a danger as criminals and as potential terrorists. In the south, where unemployment is rife, people see immigrants as low-paid workers taking jobs away from Italians, he said. He said the dispute between Malta and Italy is unprecedented and could lead to a change in how Europe deals with the regular influx of people, most of them young men, leaving Africa and the Middle East. Since 2015, about 700,000 people have arrived on Italy’s shores, according to Interior Ministry numbers. Hundreds more have died at sea. Africa is undergoing a population boom and rapid industrialization. It also is suffering from far-flung conflicts, internal strife, unemployment, desertification and many other problems.